Yay! (Seriously, I so said yay out loud hehe.) I’m excited for you, getting into it and taking a try at it. Plyo wise, if it weren’t so much upper body and planking, I’d suggest Buti to you. (I’d suggest it anyway, it’s great for body strength with just using your own body weight.). I’m not sure how your arm would do though. I actually did plyo yesterday. It was so hard that I only managed to do about 30 minutes of the hour-long video 😦 I still woke up with really sore muscles though, which is great 🙂 I love feeling like I’ve worked my muscles really hard. I’m glad you were able to do at least 30 minutes of your video? Trying is better than not trying, and thats what counts! Keep at it! How are you doing so far? I am on week 5 day 2. When I started I couldn’t even run 30 seconds and it took me several tries to do day 1 of the program. Now I’m killing it. 54 pounds down, only 95 pounds to go! It’s going pretty well 🙂 I’m on week 4 day 2. I’m actually surprised that I’m still going lol. I thought I’d give up after the first week haha. I’m still having trouble running for 5 min straight though, but I just try to push through the pain. It’s so great to hear that your making really good progress 🙂 54 lbs is a lot! Are you doing anything else besides C25K to help shed the weight? Mainly just calorie restriction. When I first started I talked to my doctor and she helped me determine how many calories I could safely restrict myself to without causing any other issues like malnutrition. I’ve surprisingly done really well with that. I just started adding exercise after I reached 40 pounds lost. I waited because I knew my weight-loss would be a lot slower if I was adding exercise immediately. I’m easily discouraged so I was afraid I’d give up if my loss wasn’t noticeable… BUT now I am doing the couch to 5 k and walking and am still losing, but as expected it has slowed down a lot because of the muscle gain. I can actually see my progress though so even though the pounds aren’t dropping as quick I know I’m still progressing. I have raised my calories slightly. When I started I was only eating pre-portioned meals because I am a food addict so my biggest problem is not being able to stop myself from over eating, but I have now started branching out from that but still careful not to go overboard. I can tell my stomach has “shrunk” some because I don’t get hungry as much. I chew lots of gum to keep me from snacking. I actually came across your blog while googling for a Couch25K graphic to post on my website. Where did you find this one? Can I use it? Lol. My website and blog are http://www.Flabulous2Fit.com. I hadn’t thought about lifting weights. Probably would help tone my arms better. I have a lot more loose skin than I’d like but I guess it’s better than filled with fat. lol I have a YMCA membership that I never use, guess I could incorporate that along with running. I just finished week 5, that 20 minute non stop run nearly killed me, but I did it! You should definitely use that YMCA membership. Going to the gym can be a lot of fun, especially if you have a gym buddy. Btw, I updated the schedule again…Sorry! I noticed that the one that I had before didn’t completely match the C25k schedule that I was following. After a lot of googling, I realized that many of the schedules posted online are completely off. So long story still long lol…I’ve updated the photo again. 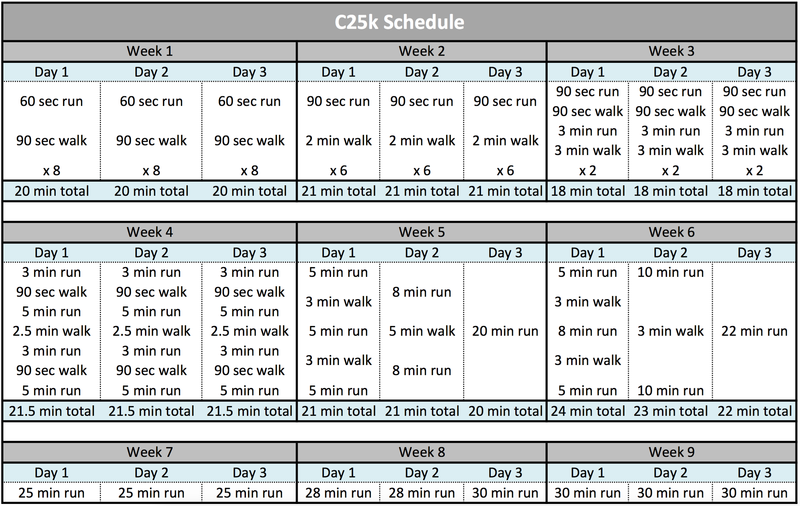 This time, I made it based on the schedule provided by the Zen Labs C25k app. So anyway, please use this new updated photo for your blog. It should follow the official schedule more closely. Sorry about all the confusion!